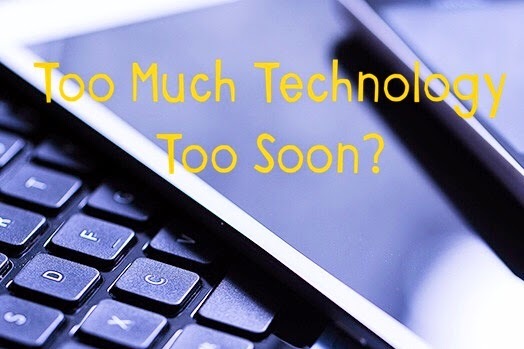 MummyBexM: Too Much Technology Too Soon? I read a very interesting reader's letter in my monthly ATL Union magazine this week, in which the reader was advocating for the use of technology in both primary and secondary school classrooms. Before becoming a mum, I was a strong advocate of technology for children in the classroom and trialled many resources for my school, such as 'voters', iPads and viewers. But is there too much technology available to our children now? Has becoming a mum changed my opinion? In short, no. I haven't changed my opinion because I have become a mum - if anything, it has strengthened my view that technology is key to my child's future. Smartphones, and other forms of technology such as tablets, have great educational potential. They provide rapid access to the world's knowledge in your hand and are a gateway to multiple forms of communication which is the bedrock on which society operates. Remember that the ability to communicate has a strong correlation with intelligence, leadership and creativity - these are all perceived as the necessary skills to be successful in life. After all, aren't these traits what all employers and universities ask for now in their application processes? I completely agree that children should not be handed an iPhone and left to it. Safety and security measures are paramount, and ensuring they fully understand the benefits and dangers of the internet is of the utmost importance. However, our children are the next generation. Most of the jobs they will have, haven't even been created yet; we're preparing them for a future unknown. It would be wrong to limit our children technologically, when their lives will be surrounded by it. For example, by the time my baby boy is in school children may no longer be using paper and pen for all their lessons - they might have tablets instead. Should we put our children on the 'back foot' simply because we're afraid of something? Health and fitness is a key argument against the increased amount of technology our children have access to. I am in full support that our children should not be shut up in their bedrooms, glued to a screen. But, surely the balance between technology, crafts, outdoor play and sports is down to the parents to manage? We should all be able to carve out a varied routine with our children so that they grow to be rounded individuals, with multiple interests. It is only down to you if your child becomes tech-obsessed. 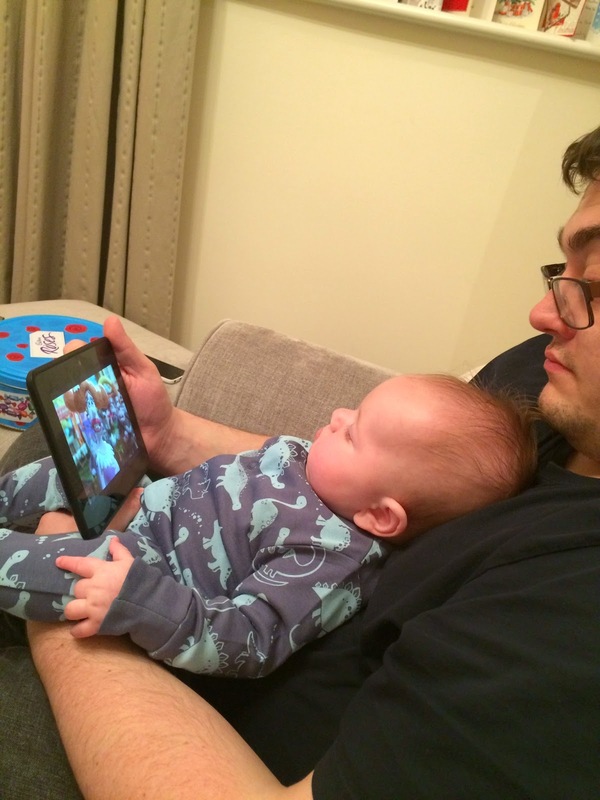 At almost 4 months, Jake is already showing interests in our iPhones, iPad and TV. The bright colours, music and sounds are all stimulating. I am not against letting him have access to them. It is controlled and under our supervision and only for a short time (e.g. A nursery rhyme on YouTube while we change his nappy). I think it's important he is comfortable with technology and not afraid of it, as so many of us are. I'd be really interested in your opinions. Do you think there's too much technology now for children, or is it right that we encourage our little ones to become familiar with the technology of the day? I have to say that when kids are very small, babies and toddlers I do not think over exposure to technology is needed and that yes, kids do get technology too soon. As they grow up there is a place for it for learning but I hate seeing kids (and adults) glued to a screen all the time when they could be out in the fresh air or making things etc. I suppose its not so much as too much too soon, but rather people overuse too soon? Brilliant thought provoking post. I agree with you, I think technology is going to be such a large part of their futures that witholding it from them would be detrimental to their development. I certainly think there should be limits on how much time they spend with technology. For example I want baby R to go and play outside in the fresh air, not spend all day in front of the telly or computer. But I also think limiting their use and 'protecting' them will in turn lead to them being less advanced then they potentially could be. And I think it encourages a naivety in them when we 'protect' them from the big wide world. I hope that I can keep baby R safe with technology but also teach him to be savvy/smart enough to recognise and avoid dangers. Great post! I'm fully aware that by the time my son goes to school in 2017, he will no doubt be using technology of some kind in the classroom. (Back in my day we had the old BBC computers!!) It would be wrong of me to keep him away from it now because it's his future. Obviously moderation is key and I wouldn't just leave my toddler with the ipad to play with all day but its a useful tool when I'm trying to cook tea and I need him to sit still for a few minutes!! This post is brilliant. I see technology as the future, heck it's the present because we can barely avoid it. But as parents we are the means to protect, educate, nourish and enlighten our children especially in those crucial early years. Therefore I think it comes down to personal preference really of how much technology you allow your children to be exposed to, where you can make that decision at all. In our house we do not own a television, for example, because we want our girls to grow up without being fed ideals and to allow them the space to be creative, and explore the world the way they want to. But having said that, we also put on certain shows for them or let them play with certain apps, because we cannot deny the educational value they offer.